Using powerful new syntheses of observational approaches to provide unique insights into the nature and behavior of matter and energy and help to answer some of the most profound questions before humankind. 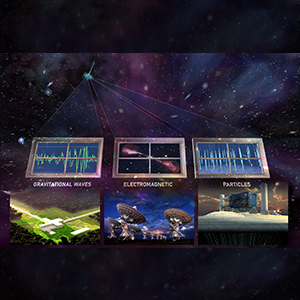 For years, we have been making observations across the known electromagnetic spectrum -- from radio waves to gamma rays -- and many great discoveries have been made as a result. Now, for the first time, we are able to observe the world around us in fundamentally different ways than we previously thought possible. Using a powerful and synthetic collection of approaches, we have expanded the known spectrum of understanding and observing reality. Video: Press conference: First cosmic event seen in gravitational waves and light! NSF brought together scientists from the LIGO and Virgo collaborations, as well as representatives for some 70 observatories, on Monday, Oct. 16, at the National Press Club in Washington, D.C. This is part 1 of the press conference.